Get Onboard: It's Time To Stop Hating The Bus Everyone loves to hate the bus, but in a piece for Salon.com, Will Doig argues that the bus is actually mass transit's best hope. He offers high- and low-tech solutions to help the oft-maligned bus system improve its image and its efficiency. In a piece for Salon.com, Will Doig argues that it's time for Americans to reconsider the bus. Everyone loves to hate riding the bus — passengers complain about cleanliness, overcrowding, timeliness and inefficiency. 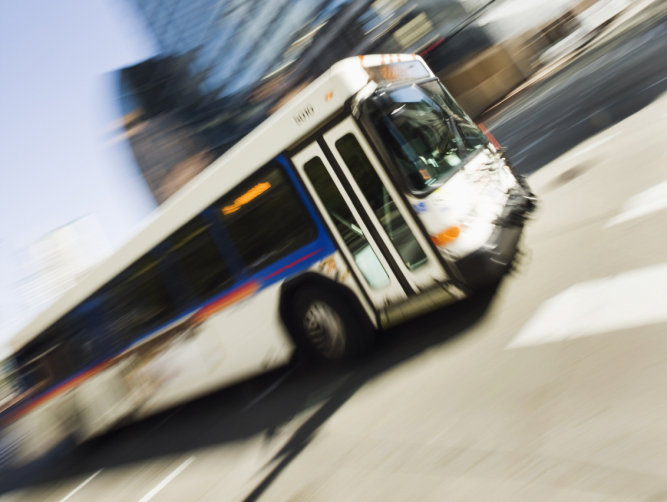 In a piece for Salon.com, writer Will Doig argues that disliking the bus is "practically an American pastime," but buses are key to improving mass transit. Doig thinks that rather than spending money on expensive new systems like light rail or streetcars, cities should focus on making buses better. "I think when people say that they don't like the bus," he tells NPR's Neal Conan, "what they're really saying is that they like the train better than the bus. And there are a lot of really good reasons for that." Doig (who admits he took the subway to the studio for this interview) says the appeals of trains — design, reliability, comfort and frequency — could easily be incorporated into bus systems. And some cities are already doing that by aiming to employ bus rapid transit, or BRT. The biggest and most effective approach is removing the bus from traffic. "If you can give it its own lane that's physically separated from cars so that even people who want to drive in the bus lane are unable to, that's the key, and you'll be zipping through the city in no time," says Doig. Doig explains why buses have an image problem and the things cities around the world are doing to improve bus transit. "With BRT, it's much easier to make the bus show up when it's supposed to. And I would say the two biggest issues with the bus tend to be frequency and predictability. They don't tend to run as often as trains, which a lot of people don't like. "There's a transit consultant named Jarrett Walker who likes to tell drivers about the importance of frequency by saying imagine if you had a gate at the end of your driveway that only opens every 15 minutes." "People don't like to talk about the aesthetics of the bus because, you know, transit agencies are strapped for cash. Who wants to make the argument that buses should just be prettier? But actually, if you think about it, the average bus costs about half a million dollars. They're very expensive. ... I talked to one design expert who's worked in bus design; he says for just $5,000 more, you could really make the bus a nicer bus itself. And if that gets more people to the fare box, then maybe the expense is worth it." "One of the problems with schedules is not just the schedule, but the actual map which relates to the schedule. First of all, look at a subway map, and it looks fairly clear where everything is going and about how often it's going to arrive. You look at a bus map, and every single route looks not only incomprehensible but exactly the same. And people have suggested redesigning bus maps to make it more visually clear how often your particular bus comes. "And in fact, not only ... with, say, bolder lines or different colored lines, but things like actually rebranding bus routes as, say, the green line, which is something that they've done in Australia. And that's more one thing that kind of makes it seem more like a train than a bus, which some people might like." "There are cities that have ... made the bus basically a form of what people see as upper-class transit. Bogota, Colombia, has a great BRT system. Guangzhou, China, has an excellent one. And I was actually just in Mexico City a couple of weeks ago checking out their new BRT system there, and it was quite a nice ride. And in fact, Mexico City has an extensive subway system as well. And since they implemented BRT, the BRT system has come to be seen as the upper-class form of transit because it's perceived as safer and cleaner. And I should also just say, during their earthquake last week, the subway system shut down and the BRT system kept running."